There’s nothing like taking a big American car out on the open highway. And it doesn’t hurt to have a small tablet along for the ride. I just went on a long road trip from San Diego to Texas, and then around Texas and Louisiana; this is the first long vacation I’ve taken where I did not take a laptop with me. You might not have noticed, though, because I still posted a few blog posts. I used an iPad and a wireless keyboard, and either hotel Internet or Verizon mobile service. When I needed to find an interesting restaurant, I used Yelp—and then typed the address into Navigon1. Propped the iPad up against the cup holders, and received spoken directions to the restaurant. The laptop never did that for me. Yelp was invaluable during the road trip. The iPad app makes it a snap to find businesses near wherever you happen to be, and bookmark them for later use. I was able to quickly find the nearest Target to our La Porte hotel, and some restaurants I never would have found otherwise: Colonial House of Sandwiches in La Porte, a Tex-Mex roadhouse in Bacliff just near La Porte, and several places in the North Dallas area. I’m usually pretty good at guessing what’s going to be a good place to eat when driving or walking past it, but Yelp made it possible for us to have uniformly great food that we would otherwise never have found. The only feature I’d like to have seen in Yelp but didn’t was the ability to list my bookmarks; as far as I could find at the time, there was no way to get a list. It now appears that bookmarks can be listed, which solves the only problem I had with it. 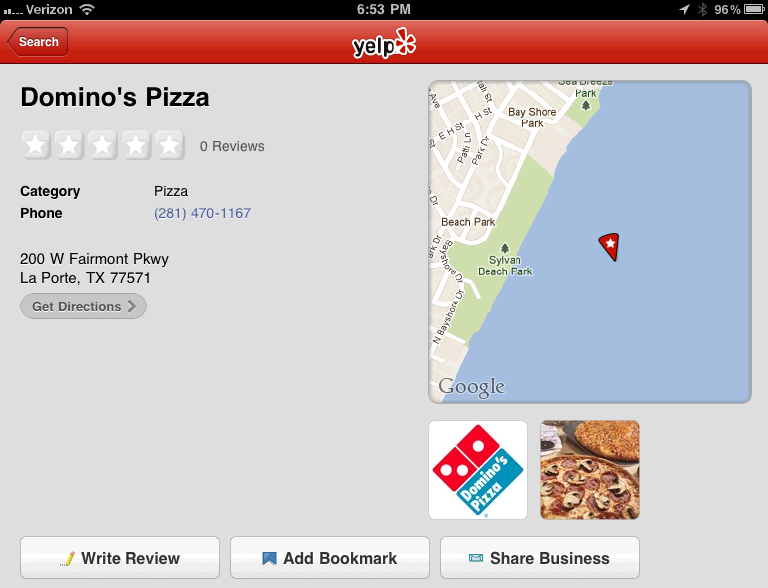 It does show a Domino’s Pizza in the water off of Sylvan Beach, but since I don’t eat at Domino’s that wasn’t a problem for me. I’ve been testing Navigon since about March, since I had planned on making my road trip much earlier in the summer. Except for an odd bit of instructions here and there that made sense only because I already knew where to go2, it’s been working fine. I also used it in rural Michigan, and managed to impress my dad because it knew where my sister-in-law’s business, which had moved only a few months ago, was. Navigon screwed up once, putting me about nine miles from Forever Young Records; in its defense, I think it was only off by about a mile as the crow flies. I’m blaming that on a bad address, though. When I went into Yelp and faked an address based on its location in Yelp’s Google Maps inset, rather than use the “real” address, Navigon got me right there. On the way back, stopping at Los Manjares de Pepe in Yuma, Navigon succeeded where Google Maps failed in January. I spent all day looking for this Domino’s off Sylvan Beach. Well, that and lounging in the ocean. Otherwise, it was great; my friend in the car with me nicknamed the iPad Esmerelda based on the Navigon voice instructions. It screws up, but always pulls through by the end of the episode. It was even able to navigate the Texas Hill Country well enough to find the two wineries we’d planned to hit and the one winery we switched to at the last minute after hearing about it at the second winery. And found Salt Lick BBQ when we decided to go there for dinner. 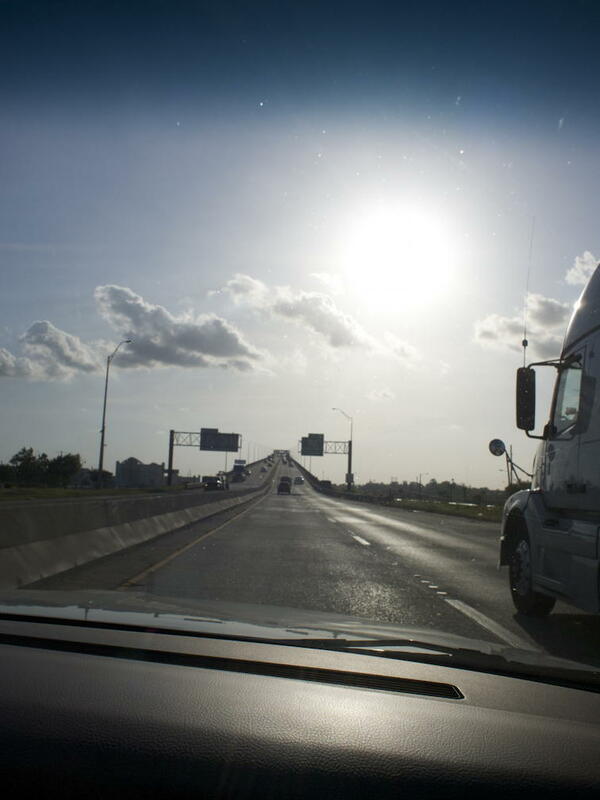 Because of Navigon, I was willing to take a roundabout route from Round Rock to Killeen—instead of the main freeway, it offered the option of taking Ronald Reagan Boulevard. In the old days I would never have done that—I get lost very, very easily. In this case, I thought the alternate route looked interesting, so I pressed the green button and took it. Navigon even continued providing correct instructions when all of my compasses flipped while going home west of Fort Worth. I still don’t know what happened. The compass in the iPad (by way of Spyglass) and the compass built into the car both flipped east and west, but not north and south. I looked up to the compass direction on the car and almost panicked because it told me I was driving east when I wanted to get back to California! This lasted until Yuma; when I pulled out of Los Manjares de Pepe, the compasses both flipped back (which, of course, also caused a momentary panic because I’d gotten used to mentally reversing east and west). Skype was also nice: the new iPad-optimized Skype app came out just as I was leaving, and I quickly downloaded it because I knew I’d want to use it in Las Cruces halfway between San Diego and Dallas. It’s a huge improvement over the old iPhone app. It’s completely futuristic: a tablet the size of a large book (or small textbook) with a full-sized screen that can be used as a videophone. Skype’s video also did not tax my bottom-of-the-line 1 GB Verizon allowance. Whatever they’re doing, it’s doing a good job of compressing the audio and video. Watching YouTube sucked down bandwidth like crazy; I had to wait until I had hotel room WiFi for that, but Skype was fine. Another bonus: the Native Union Pop handset is a great way to avoid broadcasting your conversation to the rest of the world, or to hold a conversation in noisy environments. I bought it because it was cool to have a red hotline; I keep using it because its useful. 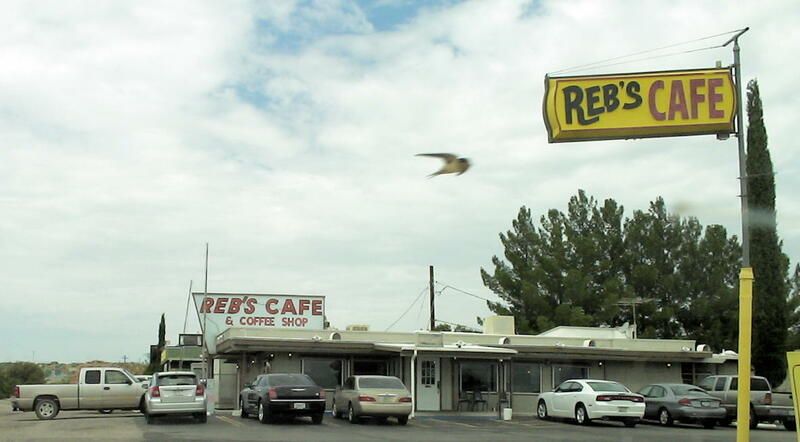 I doubt I would have found this out-of-the-way diner in Benson Arizona—two-thirds of the way between Las Cruces and San Diego—if not for the Yelp app. Really not much to say about this, except that it works, and it’s a lifesaver. I packed my desktop iMac’s wireless keyboard into my suitcase, and pulled it out when I needed to do some writing or log in to my desktop remotely. The iSSH iPad app makes remote logins easy. I used it to push blog posts while I was on the road3, and I used it to view some (text) files I’d forgotten to print out before leaving. I’ll still be using the desktop at home: there’s no way I’m giving up the 27-inch screen. But given the choice between a bulky 13-inch laptop and a svelte 10-inch iPad, there’s no contest. The iPad can go just about anywhere, the laptop always had to be babysat. When I need a keyboard, I’ve got it. I used it for hotel reservations, navigation, finding restaurants and supermarkets, writing blog posts, checking in to work once in a while4, and even finding out when would be best to drink beer and watch the final Harry Potter movie. But whenever I was getting ready to pull onto an offramp, I wanted to see the display, and that meant messing with the unlock slider, because turning off the screen means you have to unlock it to turn the screen back on. It makes sense—you don’t want the screen turning on accidentally when you’re trying to save battery power—but the location of the slider is more difficult to use than it needs to be in the car. It’s at the bottom of the screen, putting it behind whatever I’m using to hold the iPad up. Making Navigon on the iPad visible while in the car was easy, except for the slider. I had planned on getting a special mount, but there’s no need. It fits perfectly in the space in front of the cupholders, leaning back against the water bottles I put in the cup holders. That also echoes the voice navigation up nicely, too. 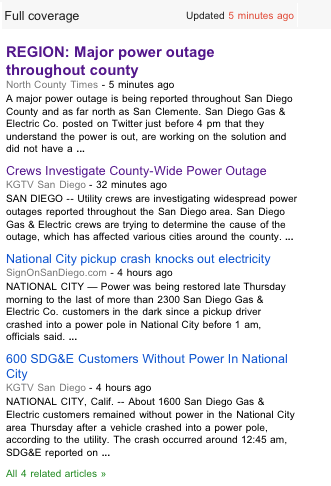 Kudos to channel 10 news and North County Times for getting a report out about the outage during the outage. What did I do on dark Thursday? I browsed the web on my iPad and made fun of SDG&E’s twitter feed. I also did the standard stuff: sat out by the pool with my neighbors playing Texas Hold ’Em and drinking Rebel Yell whiskey. Our workplace has had power issues in the past, so I didn’t really think much of it when the power went out at 3:40 and came back on again a few minutes later. Turns out the power coming back on was our backup generator, but I didn’t realize that until I got on the road. It was time for me to leave anyway, so I got on my bike and headed out. And discovered that the traffic lights were out throughout Linda Vista, Mission Valley, and Hillcrest. Fortunately, I’d left almost immediately after the power went out, so tempers had not yet flared and traffic was only beginning to back up around Hotel Circle. It being a somewhat warm day1 and the sun having beaten down on the tops of our apartment all day, my neighbors were congregating outside until the power came back on to power their fans and air conditioners. I pulled my iPad out and checked for a network connection. Got it, and saw that while most of the news services hadn’t yet picked up on it, the ones that had picked up on it were reporting that the outage went as far east as Arizona, down into Mexico, and up into Orange County! At this point, we realized that the power wasn’t coming back on any time soon. Some of my neighbors had already started defrosting for dinner, so we, like much of San Diego, started our blackout barbecue of random foods and, later, played cards. And every once in a while I’d read from SDG&E’s twitter feed for a good laugh. An event happened between AZ and CA. Think of the system as linked by springs. There isn’t, unfortunately, any way to enter an address freeform in Navigon, which means I couldn’t just copy-and-paste. As far as I can tell, a custom address in Navigon means choosing the state, the city, the street, and then the street number. The worst being the instructions for staying on the 163 near the exit ramps for 8 east and west; it first says to stay left toward 8 East when going past the offramp to 8 West; then it says to stay left on the 163 when going past the 8 East offramp. Which is technically true, but conceptually whacked. The Mimsy blog system is a CMS based on Django that pushes static files to my web site. Necessary to get a three-week vacation approved. I never had to plug the iPad into the cigarette outlet, even on the long drive between Dallas and Las Cruces and Las Cruces and San Diego, and I kept Navigon running—but without a screen—the entire time. The iPad is an amazingly useful tablet for doing stuff and quickly looking stuff up on the go. This is a faithful reproduction of the old-style telephone handset, perfect for use with the iPad 2 on Skype. This was a really nice Tex-Mex half-open, half-closed restaurant, with music. Reminded me of a roadhouse. The deep-fried avocado was an amazing plate, the music was good, and all-in-all it was just a great place to relax, drink, and eat, even in the Texas summer heat. Los Manjares de Pepe—Yuma: ed fromyuma at mmm-yoso!!! A great bar-b-que in the Texas Hill Country; not a bad pecan pie either. The iBooks application, like, I suspect, all good e-reader software, lets you drag and drop PDFs and images into it. Esmerelda and me: road trip with iPad last modified September 10th, 2011.